The OBI imaging system is mounted on a pair of robotic arms. It then rotates around the body while the patient lays on the treatment table and takes low dose high resolution X-ray images prior to treatment. These new images are overlaid on top of the existing images in order to determine if the tumor has moved since the last treatment. Because tissue and organs can settle around bones differently each time the patient lies down on the treatment table, tumors can end up in a different position from one treatment session to another. In addition, tumors can move several centimeters due to a patient’s normal respiratory cycle. 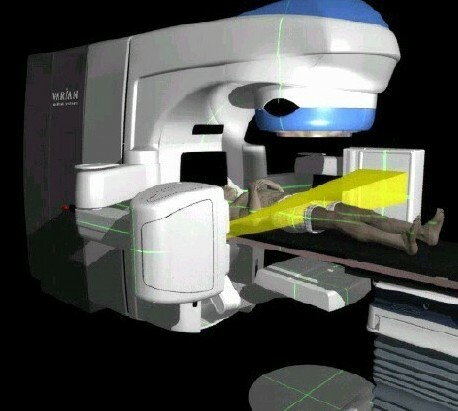 Once the tumor location has been determined, the table remotely moves and makes the adjustment to the targeted position. Higher doses of radiation can be delivered directly to tumors and cancer cells, while surrounding organs and tissues are protected. Knowing exactly where the tumor is allows the clinicians to reduce the volume of tissue irradiated, targeting only the tumor and sparing the surrounding normal tissue.